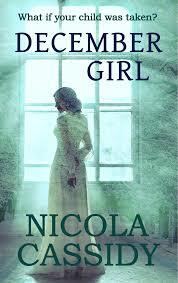 BleachHouseLibrary.ie: Book Review: December Girl by Nicola Cassidy. Book Review: December Girl by Nicola Cassidy. Molly Thomas loses more than her home, the night her family are evicted from their farmhouse in 1894. Her father is accused of stealing stones from the passage tomb at Dowth, Co.Meath, which originates back to approx. 3,200BC, but Molly knows that most of the local tenants had used the granite stones from Dowth and there a more sinister reason for their eviction. The Thomas land is owned by the Brabazon family, who live in the nearby Brabazon House, a country mansion well known for hosting grand balls and hunting events. Henry Brabazon is a gentle soul (unlike his father) and dreams of studying criminal law in London, therefor escaping the expectations attached to being heir to the Brabazon title. When Molly flees Ireland, after her father’s death, she is not to know that what she is running from is a lot less worse than what she is headed toward. Her life spirals out of control and she is not long becoming a victim of circumstance. Things go from bad to worse when her baby, Oliver, is taken from his pram outside a London shop and not one person has witnessed his kidnapping. Will Molly’s luck ever change, or is she cursed to suffer forever? The novel begins with a prologue, describing the laying of the passage tomb, and then the disappearance of Oliver. The story then flicks back to the evection and introduces the Thomas family and their polar-opposites: the Brabazons. When Molly escapes to London, via Liverpool, the narrative takes an even darker turn. The young woman is out of her depth and is preyed upon, almost instantaneously. Back at Brabazon House, Henry has his own problems: those of expectations and tradition. Then, the reader is introduced to Gladys and Albert, and a connected thread within the story. The tale continues in England and Ireland, right up until the War of Independence, and immediately afterward. This is the debut title from Co. Louth native, Nicola Cassidy, who herself grew up in the Boyne Valley and knows the landscape of Dowth extremely well. She has taken the historic monument and used it as an anchor for her story. The saga is spread over almost five decades of turbulent Anglo-Irish relations yet only addresses the violent wars toward the end of the novel, which may be to appeal to the reader who is wanting more Downton Abbey than Rebellion. The structure is a little confusing at times, with the 1896 thread being somewhat lost in the flitting to-and-fro from other strands of the saga and there are chapter headings, for example: “Dowth, Co. Meath, Ireland, St Stephen’s Day. 1894, 10.20pm (Twenty Months Before)” which could have been simplified, ensuring a more fluid reading experience. But these are small editing issues, rather than any criticism of the writing or indeed the story. December Girl is awash with historical detail about Drogheda and the surrounding countryside, even using nuggets of actual events. The linen industry is booming, the shipping port is a hive of activity and the streets are described with loving detail. Molly is a feminist, before her time and the reader is not treated to a sugar-coated view of her struggles as an independent woman. Far from it. Her story is dark and disturbing. Henry is an altogether lighter character, with a good heart and the benefit of a wealthy upbringing. Brabazon House sounds idyllic and typical of the Anglo-Irish country houses which still stand today. Nicola Cassidy is a name to watch out for. She has come a long way, in a relatively short period of time, and I am sure we have not heard (or read) the last of her yet. Book Review: What Alice Knew by T.A. Cotterell.